Dr Civai gained her PhD in Neuroscience from the International School for Advanced Studies (SISSA/ISAS) (Trieste, Italy) in 2011. She then spent almost three years working as a Postdoctoral Research Associate in the Department of Economics of the University of Minnesota (USA), In 2014, she was awarded a Radboud Excellence Fellowship, thanks to which she joined the Donders Institute for Brain, Cognition and Behaviour (Netherlands) as a Research Fellow for two years. In 2016, she was appointed Lecturer in Cognitive Psychology at the University of Kent. She joined LSBU in July 2017. Claudia investigates decision-making in socio-economic contexts; in particular, she is interested in how people perceive and react to unfairness and injustice. In her research, she integrates theories and methodologies from cognitive psychology, neuroscience, personality psychology and behavioural economics. 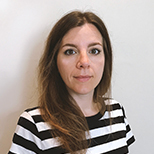 Dr Civai is interested in understanding what motivates human behaviour in social contexts; her research focuses on how people integrate emotions, self-interest and social norms in order to make socio-economic decisions, in particular when fairness and justice norms are violated. She uses a combination of cognitive psychology, behavioural economics and neuroscience methodologies in order to obtain a more detailed understanding of the phenomena under investigation. Findings from this field of research caught the interests of social policy developers and charity fundraising. Editorial advisory board for Journal of Cognitive Enhancement (2017-present). Associate Editor for In–Mind Italia, a peer–reviewed on–line journal of social psychology for non–specialised audience. Ad hoc reviewer for NeuroImage, Journal of Research In Personality, PLoS One, Social Cogni­tive and Affective Neuroscience, Cortex, Cerebral Cortex, Behavioral and Brain Research, Cognition, Neuroscience and Behavioral Reviews.